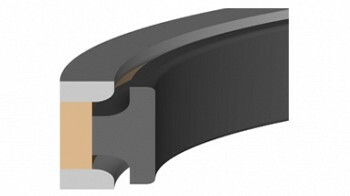 Capped T-Seals are similar in function to that of a normal T-Seal, except the elastomer energizes a PTFE cap that seals the dynamic surface. Since the PTFE cap is made a low friction material, capped T-Seals are well suited as heavy duty piston seals in high duty cycle linear actuators. Low friction also means low wear, which provides excellent long term life capability.